We’re re-certified with flying colors! 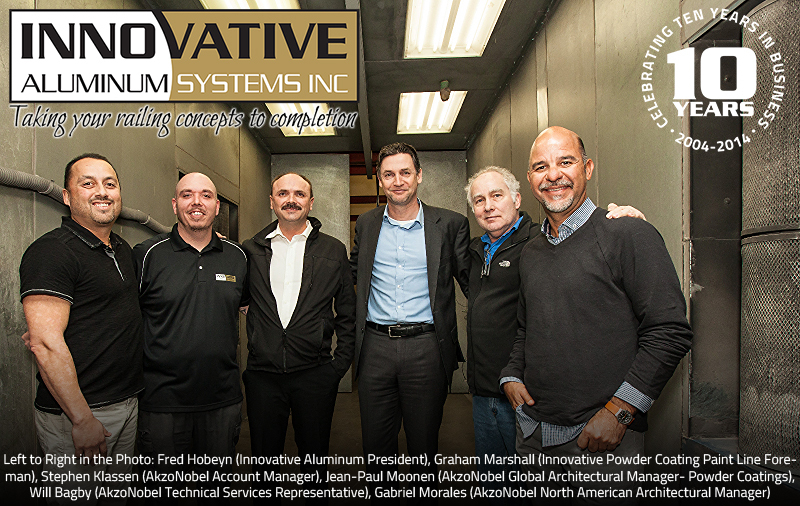 – Innovative Aluminum Systems Inc.
Home/Innovative News/We’re re-certified with flying colors! AkzoNobel visited us to acknowledge our remarkable results. The Reps and Managers from AkzoNobel, some coming from as far away as Holland, recently visited to congratulate us in person after we passed our aluminum railing powder coating facility re-certification flawlessly. Our products were subjected to many gruelling tests, including the major exposure conditions of four thousand hours salt spray and one thousand hours of acetic acid – we passed them all without any failures. The practices behind these outstanding test results are a big part of what helps keep us in the upper echelon of North American powder applicators. We’d like to thank the Innovative powder coating team for doing their jobs consistently and with excellence.